Make this easy chocolate cream pie for your guests! With a chocolate crust and a fluffy dark chocolate mousse filling, it will be the hit of the party! It’s pie season, my friend! At no other time of year do we go so pie crazy. We’ve just gotta have our pumpkin, apple, and pecan, of course! But what are all the chocoholics to do??? Behold. Chocolate cream pie. It’s the perfect solution. Even the most die-hard fruit pie lovers will be hard pressed not to sneak a slice of this! 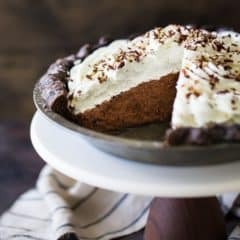 It’s just so irresistible, with its flaky, buttery cocoa crust, it’s fluffy dark chocolate mousse filling, and all those swirls of sweet whipped cream! And the best news of all is, you don’t have to bake the filling! So it frees up plenty of oven space for all those other great dishes on your menu. It will make your life so much easier to have a make-ahead dish stashed away in your fridge. You can bake up the crust several days beforehand, and make the mousse the night before. On the day you’re ready to serve, just throw on the garnish. For the chocolate shavings, run a veggie peeler down the long side of a chocolate bar. Easy as can be, but so impressive. Any time I make anything chocolate, I always start with Ghirardelli. It’s premium quality chocolate, but so convenient to pick up at my regular grocery store. The results are always stellar! Ghirardelli gives the most intense, rich chocolate flavor! 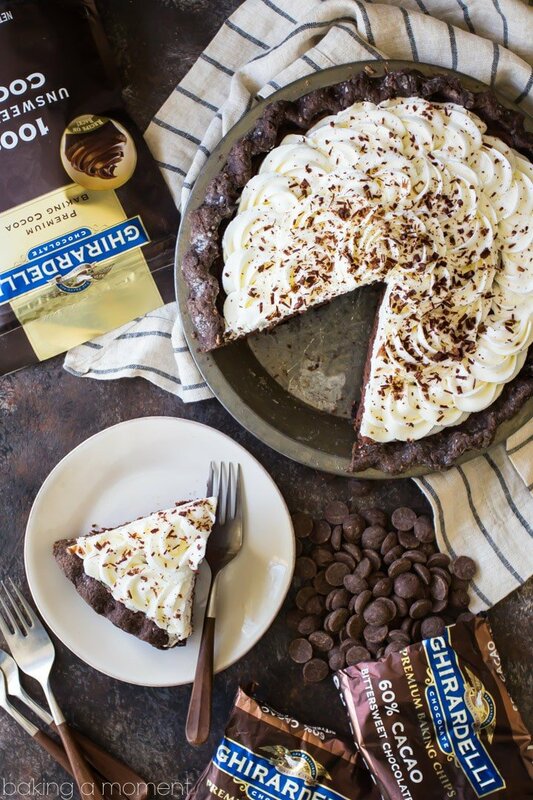 I use Ghirardelli unsweetened cocoa powder in the pie crust. The color is darker and the flavor more pronounced than any other grocery store cocoa powder. And the filling is made with Ghirardelli 60% cacao bittersweet chocolate chips. The flavor is just incredible! So rich and dark chocolate-y. Those chocoholics will be thanking you! Chocolate shavings made by running a veggie peeler down the long side of a [url]Ghirardelli Bittersweet Chocolate 60% Cacao Baking Bar. Flatten the dough into a disc shape, wrap tightly, and chill in the refrigerator for 1 hour. On a lightly floured surface, pat or roll the dough into a rectangle about ½-inch thick. Fold it into thirds, like a letter. Roll out again to a thickness of ½-inch. Turn the dough 90 degrees and repeat two more times. Dust the work surface with flour, and roll the dough out to an inch or two larger than your pie dish. Roll the dough around the rolling pin, and transfer to the dish. Place the chocolate, water, cocoa powder, sugar, and salt in a large bowl and microwave in 30 second increments, stirring, for 1 to 2 minutes, or until melted and smooth. Fold in the whipped cream and vanilla until combined. Transfer to the cooled pie crust, cover loosely, and refrigerate for two hours (or preferably overnight). Check out my chocolate pie crust recipe for a full video tutorial! Ok I am OBSESSED. This looks so delicious, and using a chocolate mousse instead of a regular ganache is such a great idea! Pinning for later! So happy you like it Kelly! Thanks so much for pinning; hope you enjoy! Ghirardelli’s is my favorite chocolate to bake with! Yum!! Mine too! Thanks so much Melissa! Thank you so much Kayle! It was sooo good! Made this as a New Year’s treat and love the filling, but my crust dough was way too dry and crumbly…used 6 tablespoons of ice water but still so dry? I’ll use the filling recipe again for sure! So happy you liked the filling Kelly! You can add as much water as you need to get the crust to the proper consistency. Thanks so much for the feedback! If I make this on Thursday night, do you think it will still be good on Sunday? We are having guests arrive for Super Bowl and I do not want to bake while they are here. I think that would work Sherry but I’d try to keep the components separate if you can. 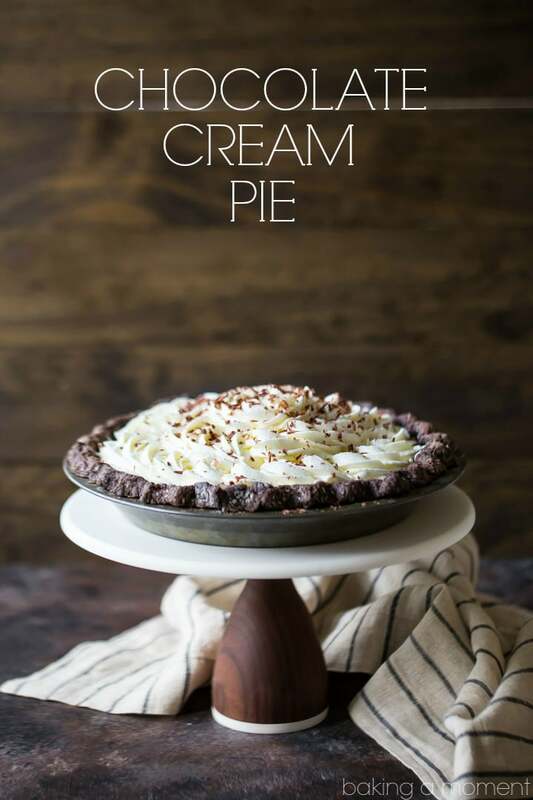 If the pie is filled the crust could get soggy and the whipped cream might deflate or weep. Is it possible for you to just assemble it the day of? The perfect amount of chocolate! The perfect amount of fillings, and oh my gosh it looks so good! 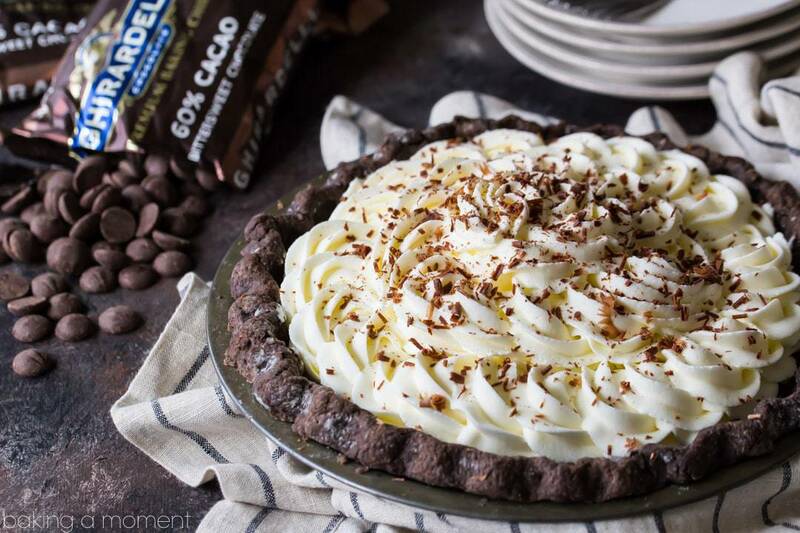 There is SO MUCH to love about this chocolate cream pie! It’s sure to be a crowd-pleasing dessert! this would be a crowd favorite!! !